(Southern Weekend) Hunan Economic TV Reality Show Creates Trouble. By Zhen Xiaofei (甄晓菲). March 5, 2008. 32-year-old Zhang Chen finally accepted a public apology from Hunan Econmic TV as well as financial compensation. "Actually, the apology was made over two program episodes because I was not satisfied with the first one." The compensation was rumored to be somewhere between 500,000 yuan to 1,000,000 yuan "but actually not enough to pay my legal fees." On June 20, 2007, the program <In Search Of Love: White-collar complications in marriage> was first shown. Since then, the female cadre Zhang Chen has been involved in a lawsuit, lost 5 kilograms in weight and split up with a boyfriend with whom she had been discussing marriage. Zhang Chen was not a dedicated fan of the Hunan Economic TV reality show <In Search of Love>. Occasionally, she would watch the show for the family violence of the hair pulling and nail scratching variety. She never imagined that she would become a featured star some day. On June 13, 2007, Wednesday, Zhang Chen got off work, returned home, changed clothes and was about to go out for dinner. The doorbell rang and she spotted a male stranger through the peephole. The man asked for Zhang Chen. She opened the door. The man claimed to be a television reporter and wanted to interview her about "certain personal emotional issues." Within seconds, two more persons showed up. One held a television camera while the other was a screaming female. Instinctively, Zhang Chen slammed the door. Zhang Chen recognized the woman as Liu Ping, the wife of her friend Dong Li. At the time, Tong and Liu were going through divorce proceedings, and Zhang found a lawyer for Dong. For this reason, Liu Ping even went to cause trouble at the workplace of Zhang's ex-husband. Liu Ping was screaming outside Zhang's home and demanding her to hand over the husband. Zhang Chen called her supervisor and then Dong Li. The supervisor said: "You are alone in your home. Do not open the door." Dong Li said: "Let me come over and see what is going on. Do not open the door." Meanwhile, someone with a 130 mobile telephone number kept calling Zhang Chen. The person claimed to be a reporter with <In Search of Love> who was working on an episode with the principal Liu Ping. Over the telephone, Zhang Chen said that she was willing to be interviewed subject to certain conditions. First, the interview should not take place at her home or workplace. It could be at a coffee shop, for example. Secondly, she would not face the camera -- she was willing to clarify things, but she will not go public over someone else's family affairs. Thirdly, the principal Liu Ping must not be present for she was too emotional. The reporter refused to accept any of the conditions. "What would happen if Liu Ping comes in and assaults me? She has been screaming outside the door for some time already and she has not calmed down emotionally. I am a single woman at home. Why should I open the door for this group of people?" Zhang Chen told the Southern Weekend reporter. 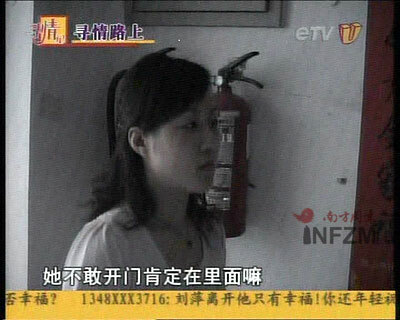 She refused to open the door and spoke to the TV reporter by mobile phone: "He (Dong Li) is not here with me. He is not at my place. The TV reporter said that they had filmed the two of them near Zhang Chen's home. Zhang Chen said: "You ask him to come over. Did you see us come home together? It was because I found him a lawyer. What is it to you that he wants to see me? Zhang Chen did not know that the <In Search of Love> crew had been secretly following her for five days already. On the afternoon of the next day, office colleagues told Zhang Chen that the TV reporter and the principal Liu Ping had gone to the Land Taxes Department in Yuhua district to ask to interview the director of the department. The office manager Li Xiaobo immediately rejected the request. "According to the marriage law in China, marriage and divorce are personal matters that do not require the work unit to offer any opinions." In recalling the situation that day, Li Xiaobo remembered a small detail. "In the TV program, Liu Ping was holding her hip and limping along. But when they came to our office, she was agile. When we refused to let her see the director, she quickly raced up to the director's office on the fifth floor. The two of us could not stop her." When the Hunan Economic TV reporter left the Land Taxes Department in Yuhua District, he told the receptionist: "I am going to expose your kind of attitude on television!" Another day went by. Zhang Chen's so-called "third party affair" was known to everyone at the Land Taxes Department in Yuhua district, and even all of Changsha city. The Land Taxes Department dispatched three cadres to the Hunan Broadcasting Group. They helped to clarify things for Zhang Chen and they also protested the method. Finally, they arrived at a written agreement with the Metro Channel. Hunan Economic TV said that the show must go on. However, they would only deal with the marital problem between Dong Li and Liu Ping. Zhang Chen would be left out of it -- Zhang Chen's name and voice would not be aired; her work unit would not be mentioned; the lobby of the Land Taxes Department would not be shown; and there would be no visual image of Zhang Chen. Liu Ping: She dares not open the door, so he must be inside. Wang Yan: Why does he dare come outside? Zhang Chen thought that the incident was over. "This was a story about a conflict between spouses and they did not interview the husband. How can this be? I thought that the program could not go on." At past 9pm on June 18, Zhang Chen suddenly saw the preview for Wednesday's <In Search of Love>. The episode was titled <White-collar complications in marriage> and she saw shots of herself being secretly followed. Zhang Chen was stunned. The next day, she went with the Land Taxes Department leaders once again down to the television station. This time, she met the program host Wang Yan. "Wang Yan said that there was no time to do any more interviews, because the show had already been edited. It is now in the production process and there was no way to withdraw it. She also said that if your department leader had not come, you people would not even be allowed to step inside the Hunan Broadcasting office building!" Zhang Chen told the Southern Weekend reporter. From that day, Zhang Chen and her lawyer made several calls to Wang Yan, who never picked up the telephone. The preview continued to be aired on June 20. The words <A successful female cadre became someone's mistress> continued to be repeated over and over again. Over the next few months, Zhang Chen had to watch that program episode again and again for the purpose of collecting evidence. The conversation that Zhang Chen had with the TV reporter was transmogrified on screen. "He is not with me. He is not at my place" was disappeared altogether. The reporter said that he filmed the two of them near her home. When Zhang Chen replied, "You tell him to come here," that was disappeared as well. Instead the TV reporter asked: "Can you bring the man out?" Then Zhang Chen was heard to reply: "Did you see him come home with me? That is because I helped him to get a lawyer. What is to you for him to come and see me?" So it became fact that the two of them were meeting secretly at Zhang Chen's home. During the program, the commentator said: "Zhang Chen is a worker at a well-known department in Changsha. Her family circumstances are excellent ... so why did the husband of Liu Ping pursue this divorcee? Could it really be for the money? ..." Liu Ping produced a photo of Zhang Chen and Dong Li taken during a tourist trip. In the program, Liu Ping was limping because she said that Zhang Chen "told my husband to beat me up and turn me into a cripple!" The program contained a secretly film clip in which Zhang Chen's car was followed. Hers was a dark blue Palio with the license plate being clearly displayed as Hunan AF 1616. The voice-over said: "Zhang Li's car kept on going and then it stopped at an intersection. A man got in. Liu Ping immediately recognized the man as Dong Li." Meanwhile, the visual image only showed Zhang Chen's car as well as other cars on the road. The car never stopped and there was not video clip of any man getting into the car. During the entire program, Dong Li was never interviewed at all and Zhang Chen was not directly interviewed. There were only secretly filmed clips and some edited telephone conversations. Dong Li's sister Dong Min told the Southern Weekend reporter said that the family waited several days for the TV crew to show up, but nobody ever came. The television program was shown thrice. Zhang Chen said: "I was really near collapse at the time. I had no idea how I got past those few days. I did not step out of my home. I did not dare go anywhere." "My father has an ailing heart. Every time that the program came around, I had to take him out because I was afraid that he might catch the program while changing channels. Zhang Chen even seized the remote control device to make sure that her family did not see the preview about <A successful female cadre becomes someone's mistress> with her face shown from the secret videos. Another reason why she did not want to show her face was that the principal Liu Pling brought several people along to the lobby of the Land Taxes Department in Yuhua district and told everybody to watch <In Search of Love> that evening. She also called Zhang Chen's father and friends to tell them to watch the show. She sent SMS to all her colleagues at the tobacco company to tell them to watch the show. She even sent SMS to Zhang Chen's ex-husband, her current boyfriend and his relatives, colleagues and even his sister. She claimed that Zhang Chen offered a bribe of 200,000 yuan to stop the program without success. Zhang Chen's mobile phone was bursting from the calls. June 24 was her birthday. On that day, she received best wishes from many of her friends, including some whom she did not know very know. She found out that Liu Ping had told everybody that this was Zhang Chen's birthday. When interviewed by Southern Weekend, Hunan Economic TV host Wang Yan declined to comment about the program episode and the lawsuit. She said, "The competition is very keen during that time period. We need to compete against the television drama series during prime time, we need to compete against programs of the same type ... we have to get the television ratings!" Each episode of <In Search of Love> is about the story of a particular family. Wang Yan said that "drama is always put in the first position. Therefore, we will select a subject from among those who telephone us for help. Based upon the needs of the program, the reporter will seek out the story." With respect to the subjects, "We usually communicate with them and we will choose those who are articulate and willing to express themselves." "What if the subject wants to use you to vent their anger or perhaps make up a story?" asked the Southern Weekend reporter. "That will depend on the experience and judgment of our reporters. Some principals come to us for money or other motives. We place the program first, we will film the show and we will expose the motive of the principal at the end. According to a worker with <In Search of Love> who declined to publish his name, the reporters for the program are young, they are inexperienced, they usually have just three days to work on an assignment and they turn in raw material. The producer Wang Yan does not participate in the interviewing. The studio interview and the final summary are usually drawn from the raw material. Zhang Chen was not the only person who took <In Search of Love> to court. Two years ago, a male principal named Peng sued <In Search of Love> at the Kaifu People's Court but lost. Also Luo Jianwu (of Xiangtan, Hunan) and Tang Zhigang (of Zhuzhou, Hunan) also told the Southern Weekend reporter that their stories on <In Search of Love> were inaccurate. In October 2007, at the first routine pre-trial meeting, the Hunan Economic TV lawyer asked Zhang Chen directly: "Do you want money? Just say so. Don't bother with going through the trouble of getting 10,000 RMB or 20,000 RMB." Zhang Chen's lawyer Liao Wenti immediately blocked the attempt: "First, you must acknowledge that your television channel has violated my client's rights. If you acknowledge that, we can talk about the compensation next." As the other defendant, Liu Ping said nothing in court and she refused mediation. When she exited to the court corridor, she hollered: "I've seen shameless people before, but I have never seen anyone so shameless!" The legal progress went from October 2007 to February 2008. Zhang Chen typically spent several hours a day on the telephone all about settling the case. Hunan Economic TV offered at first to apologize at a Land Taxes Department meeting with the 300 workers there. Zhang Chen disagreed. "You create an impact on television and so you must apologize on television. How many people at the Department know?" Next, Hunan Economic TV offered to publish an apology in the newspaper <Hunan Broadcast TV News>. Zhang Chen disagreed. "I asked for the front page in <Changsha Evening News> but they disagreed." 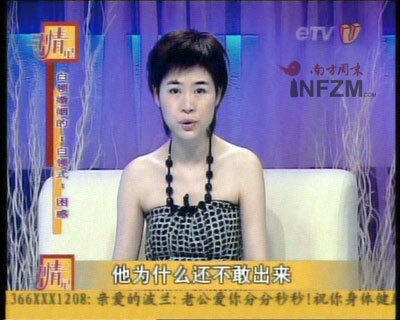 At 11am on February 27, 2008, the Southern Weekend reporter received an SMS from Zhang Chen: "Hunan Economic TV will apologize to your friend Zhang Chen on tonight's <In Search of Love>. Please pay attention." But Zhang Chen was not satisfied with the program. "First, Wang Yan said that the episode was 'partially inconsistent with the facts.' Can you tell me which part is inconsistent and which part is consistent? Secondly, they admitted that their workers did not go into sufficient depth in the interviewing and therefore caused complications for the principals. Is it just complications? My normal life had been disrupted." After the first showing, Zhang Chen refused to accept the apology and continued her complaint. The February 27 episode was not re-broadcast according to past practice. Hunan Economic TV told Zhang Chen: "We will apologize again. That first broadcast was a 'free gift' to you." In the February 28 episode, the two parts that Zhang Chen had been unhappy about were changed. "Partially inconsistent" became "inconsistent." "Complications" became "damage." The workers not only did not go into sufficient depth, but supervision was lacking as well. Although Zhang Chen did not feel that the producer/host Wang Yan was sincere, she ultimately accepted the apology. "They told me that the TV channel had never apologized to a victim like me before. This was extraordinary. Compared to other people, I can at least afford to file a lawsuit." On the evening of February 29, the Southern Weekend reporter learned that the charge against the first defendant Hunan Economic TV has been withdrawn. The second defendant Liu Ping is now the sole defendant in the case.